The woman who sewed this parka used a lot of small pieces and obviously didn’t throw things away. I’m sure she didn’t, because these are very tiny pieces of sea otter, which she would have saved. It appears that she didn’t waste anything; she even left the feet on some of the squirrels! The furs used for this man’s ceremonial parka suggest relative wealth and status. It was sewn from forty-eight ground squirrel skins with the tails left on. Tassels of valuable sea otter fur and strips of red wool cloth and white ermine fur accent the horizontal seams; fringes of red-dyed squirrel skin ornament the vertical ones. White caribou fur appears on the collar, cuffs, shoulders, sleeves, and chest, and strips of mink were added to the shoulders. 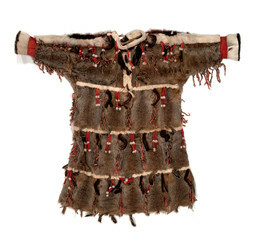 Decorative tabs made of red cloth, caribou hide, and dyed seal esophagus are attached to the back of the collar. Martha Demientieff: When I’m out there berry-picking, I have a picture in my mind of my ancestors – we don’t know how many thousands of years back – and I see their clothing, and I see them picking the same kind of berries I’m picking, with the same feeling about this is for my children – this is going to be so good. This is food for our body and for our soul. It’s something that our grandmothers have done forever, we don’t know how long. And you feel pretty protected knowing that you’re still walking the path that they walked ahead of you. It’s wonderful, knowing this for now my Alutiiq path. . . . . I’m very aware that every elder is a teacher, and that’s a big responsibility. . . . Now, the clothes I wear, the material things I have – I haven’t lost them but they’ve shifted. Now, the masks are on the wall. The dress is only used for special occasions. The fur boots are my best clothes that I wear only for big important events. Some of those Native clothes are still practical – big beaded fur mitts, and parkys [parkas] and ruffs and all that. But a lot of the other things have shifted to not for everyday use, but for more ceremonial or celebration.